I fall into the first one; our decorations are already up. After being inspired from Sarah’s show at Momtv tonight on blogging about the holidays, I thought I’d share some of our Christmas decorations with you – although I think I was the only one in the chatroom on Sarah’s show who’d already started decorating. At least I didn’t start before Thanksgiving like some friends of mine do! 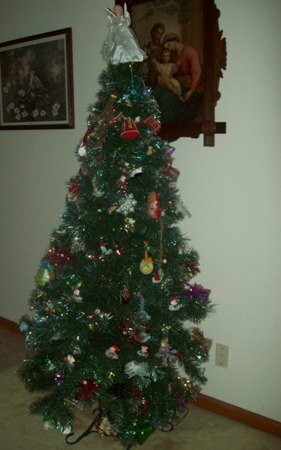 Here is our Christmas tree. 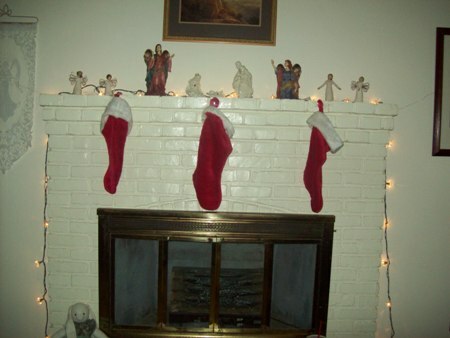 Yes, it’s already up, it’s decorated, and -GASP! – it’s not real. That’s right, a FAKE tree. I really dislike anything artificial, including people. This is NOT what I want, but my husband Ray previously worked as a firechief and a fireman for many years, and he has seen way too many fires with way too many real trees. 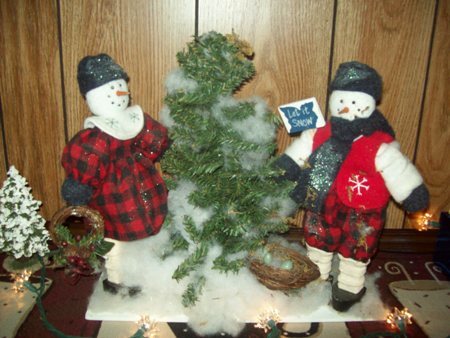 We always had a real tree when I was growing up, and I love the fresh pine scent and miss having a real one! Several years ago, I bought this fiber-optic one. 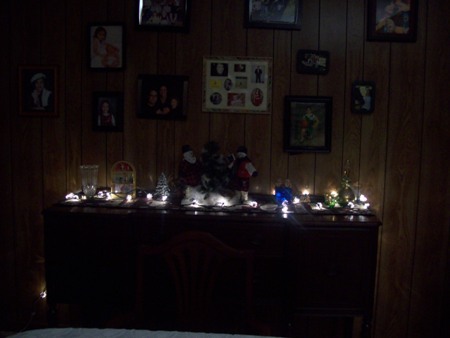 The pic doesn’t do it justice when it’s all lighted up at night, and right now it’s looking very lonely without any presents yet…but Ray’s Christmas bonus is around the corner, so soon there will be the gifts under it, which I LOVE to give! Many of our tree’s decorations are ornate, home-made ones from Ray’s grandmother and his mom. 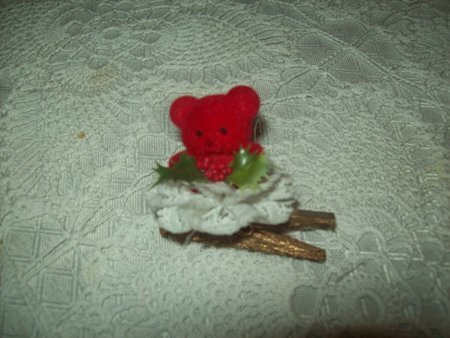 Some of my favorites are the little bears glued on lace, attached to a tiny clothespin. 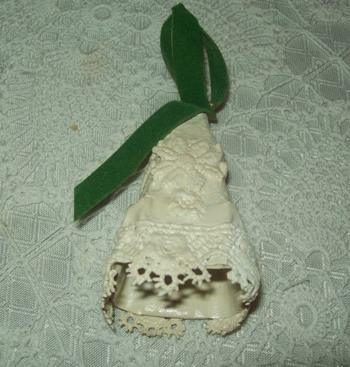 Another favorite are “lace” bells made from old egg cartons, glued with lace, and painted pure white. This week I hope to get stocking hooks (holders) – the scotch tape just isn’t doing the job very well! I added some of my Willow Tree angels to the nativity scene. 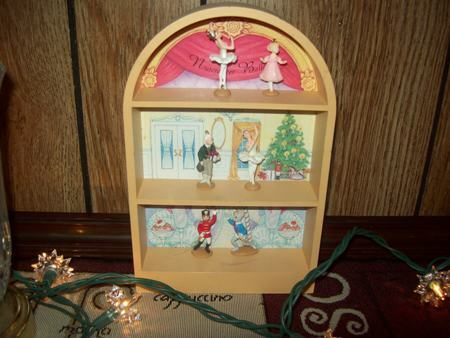 Here is the Nutcracker decoration. The tiny ballerina is so cute! I have never actually gone to this ballet, but am praying this Christmas we can go see it! 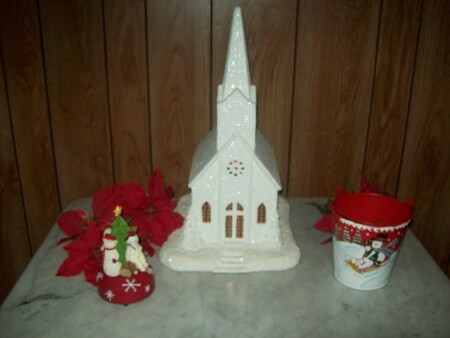 In the dining room on the marble-topped table, I put the little church made by a friend of Ray’s mom. It has a steeple, tiny stained glass windows on the side which light up with a switch, and it plays the old instrumental hymn, How Great Thou Art. I added more snowmen on the sides and a spray of red poinsettas beside the church for some color. 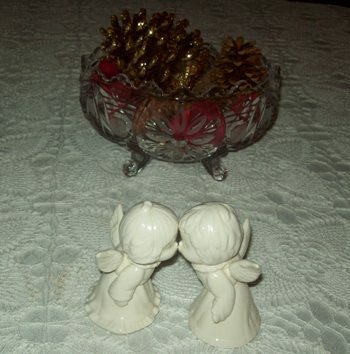 On our formal dining table, the centerpieces are an antique, crystal-glass bowl filled with red rose petals and gold spray-painted pine cones, and a cute, kissing little boy and girl angel. 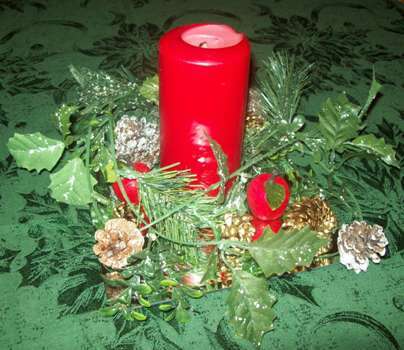 Our kitchen table has a centerpiece with a thin, square-cut mirror, a thick red candle, and a spray of greenery, gold spray-painted pine cones, and cranberries. It is simple but pretty, especially on this forest-green tablecloth. What about you? 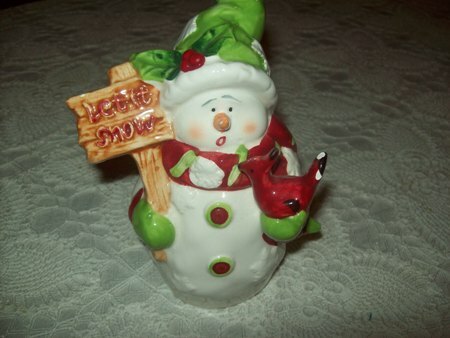 Have you started decorating for Christmas yet ? Please leave your comments below and tell me some of your favorite decorations and holiday traditions! I love Sarah’s blog and enjoyed watching that show -she’s really sweet! Will look out for a Nativity Set for you and pray you find one. I love them, too! 🙂 Thanks for commenting, Jane! I have been looking for a new nativity set. I would like one where the figures look like they are from the Middle East. It’s hard to find ones with a darker skin tone. If you see any, let me know! Thanks for your post. I loved seeing all your decorations!